[169 Pages Report] The Global Performance Additives Market is projected to reach USD 110.35 Billion by 2021 at a CAGR of 8.0%, in terms of value. The market is driven by the increasing demand for performance additives from end-use industries, such as packaging, household goods, and automotive. The base year considered for the study is 2015 while the forecast period is from 2016 to 2021. The report includes an analysis of the performance additives market by region, namely, North America, Europe, Asia-Pacific, Middle East & Africa, and South America. 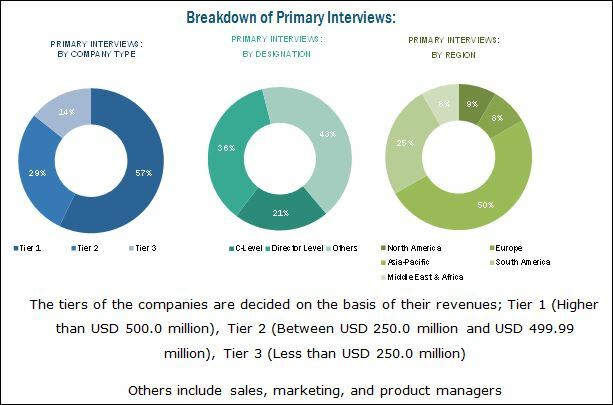 The top-down and bottom-up both approaches have been used to estimate and validate the size of the global performance additives market and to estimate the size of various other dependent submarkets. The research study involved the use of extensive secondary sources, directories, and databases, such as Hoovers, Bloomberg, Chemical Weekly, Factiva, Commonwealth Scientific and Industrial Research Organization (CSIRO), Securities and Exchange Commission (SEC), American National Standards Institute (ANSI), Organization for Economic Co-operation and Development (OECD), and other government and private websites, to identify and collect information useful for the technical, market-oriented, and commercial study of the performance additives market. Country-level analysis of the performance additives market is provided by end-use industry. 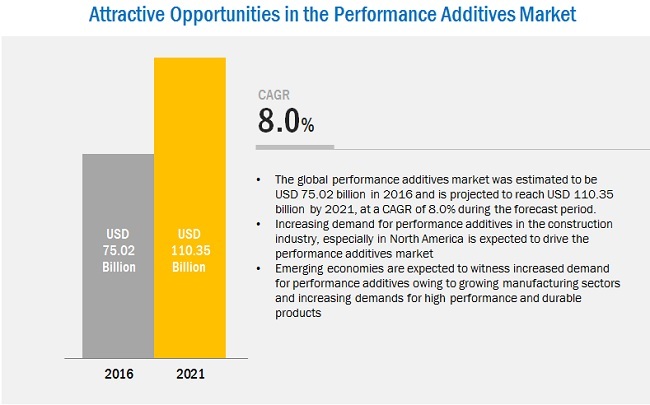 The global performance additive market is projected to reach USD 110.35 Billion by 2021, growing at a CAGR of 8.0% in terms of value. The market has witnessed significant growth in recent years, and this growth is projected to persist in the coming years as well. Performance additives are used in a wide range of end-use industries, including packaging, household goods, automotive, industrial, construction, wood & furniture, and others as these additives enhance the processability, performance, and appearance of the final product. Performance additives are materials added to plastics in small quantities to improve their performance and durability. For this report, the performance additives market is segmented based on type into plastic additives, rubber additives, ink additives, pigment additives, and paint & coatings additives. The plastic additives segment accounted for the largest market share in 2016, due to the suitability of these additives in several application areas. Plastic additives are ingredients that are added to polymers to improve their characteristics, such as strength, durability, and heat sensitivity. The demand for plastic additives is estimated to grow on account of the increasing consumption of plastic and the rising disposable income of consumers. However, the paint & coatings segment is estimated to be the fastest-growing type segment of the performance additive market, in terms of value and volume, due to the increasing acceptance of paint & coatings additives in various end-use industries, such as packaging, household goods, automotive, industrial, construction, wood & furniture, and others. In 2015, the packaging end-use industry segment accounted for the largest share of the performance additives market, in terms of value and volume, followed by household goods, construction, automotive, and others. The packaging segment is also projected to grow at the highest CAGR from 2016 to 2021. The geographical analysis of the performance additive market includes five main regions, namely, North America, Europe, Asia-Pacific, Middle East & Africa, and South America. Asia-Pacific is the largest market for performance additives. The Asia-Pacific performance additives market is also projected to grow at the highest rate during the forecast period. The demand for performance additives in this region is mainly driven by their increased use in the packaging and household goods industries. Europe is the second-largest consumer and manufacturer of performance additives. Packaging and household goods are the top two end-use industries contributing to the growing demand for performance additives globally. 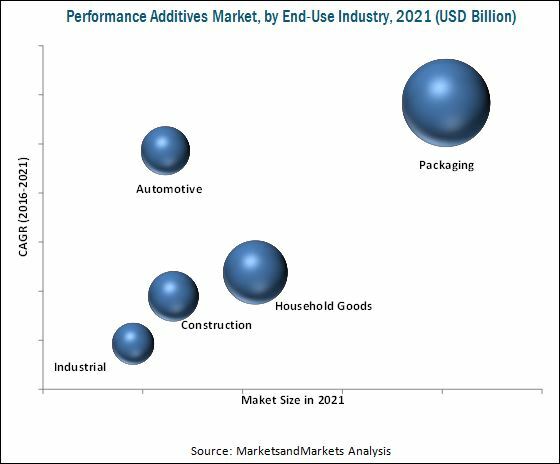 Though the performance additives market is growing at a significant rate, a few factors, such as the high price of raw materials, shift of the end-use market from developed countries to emerging countries, and the rising cost of production, hinder the growth of the market, globally. BASF SE (Germany), AkzoNobel N.V. (Netherlands), Solvay S.A. (Belgium), Evonik Industries AG (Germany), Lanxess (Germany), Arkema SA (France), and Huntsman International LLC (U.S.) are the leading companies in this market. These companies are projected to account for a significant share of the market during the forecast period. Entering into related industries and targeting new markets will enable performance additive manufacturers to overcome the effects of volatile economies, leading to diversified business portfolios and increase in revenues. Other major performance additive manufacturers include Altana AG (Germany), Clariant (Switzerland), and The Dow Chemical Company (U.S.).